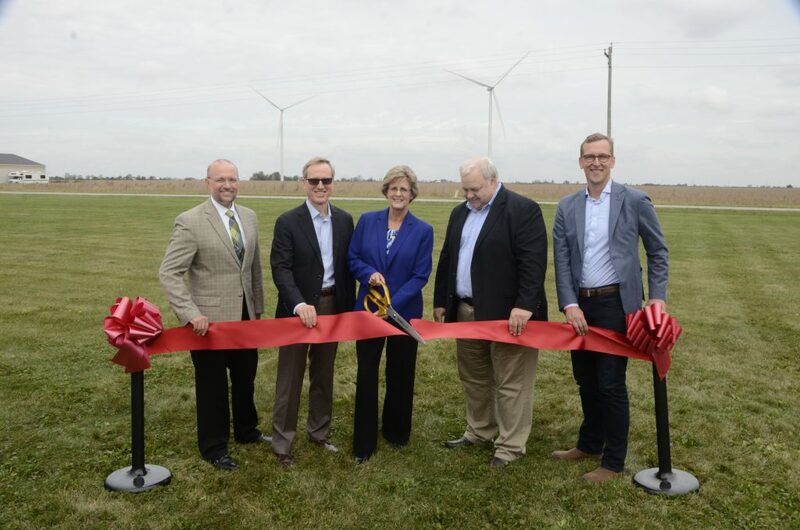 With the completion of EDP Renewables’ Meadow Lake V Wind Farm in White County Indiana, Hoosier Energy Rural Electric Cooperative, Inc. and Wabash Valley Power – Indiana’s generation and transmission (G&T) electric cooperatives – will soon be recipients of a combined 100 megawatts (MW) of wind energy. 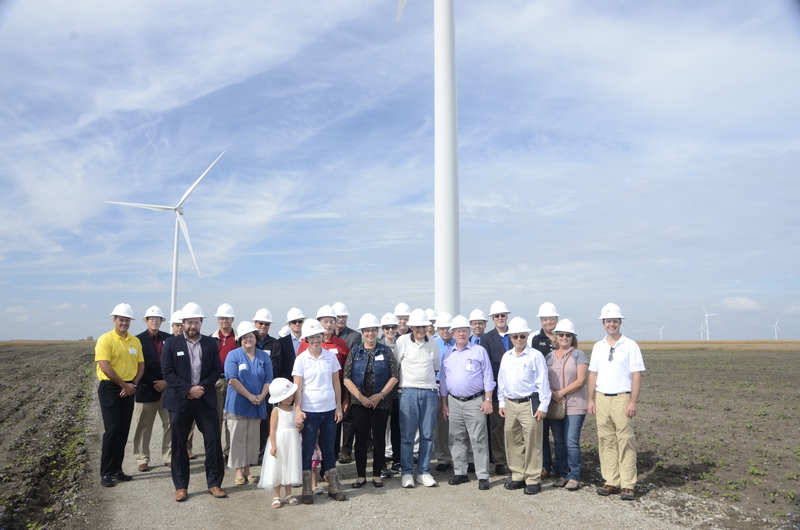 A joint site dedication for the Meadow Lake V Wind Farm was held today in White County. Hoosier Energy and Wabash Valley Power are not-for-profit wholesale providers of electricity. The 100 MW of renewable energy from Meadow Lake V Wind Farm will benefit Hoosier Energy and Wabash Valley Power’s combined 41 distribution electric cooperatives, located in Indiana and parts of Illinois and Missouri. Over 611,000 homes, farms and businesses served by the 41 distribution cooperatives will benefit from the wind pact. In 2016, the two G&Ts entered into a 20-year power purchase agreement with EDP Renewables to purchase 100% of the wind capacity from Meadow Lake V, creating the impetus for the development. Located near Interstate 65 in northwestern Indiana, the first phase of the Meadow Lake Wind Farm began operations in 2009. With the completion of phase V this year, the total installed capacity is 601 MW – enough electricity to power approximately 159,000 average-sized Indiana homes. In addition, the economic benefits EDP Renewables’ wind farms bring to the state include the creation of 674 construction jobs, 66 permanent jobs, and an additional $7.4 million in cumulative payments made to local governments. Click here to view a video about Meadow Lake V Wind Farm. Wabash Valley Power Association is a not-for-profit electric generation and transmission (G&T) cooperative based in Indianapolis. The G&T provides wholesale electricity to 23 retail electric distribution cooperatives in Indiana, Illinois, and Missouri. Collectively, these cooperatives supply electricity to more than 311,000 homes, farms, and businesses. *WVPA supports renewable energy by owning landfill gas generation and purchasing the output of wind farms and biogas generators. Wabash Valley Power sells, separately, the environmental attributes associated with this generation to its members and third parties, and therefore does not claim the generation as renewable within our own supply portfolio. Visit www.wvpa.com for more information. EDP Renewables (Euronext: EDPR) is a global leader in the renewable energy sector and the world’s fourth-largest wind energy producer. With a sound development pipeline, first class assets and market-leading operating capacity, EDPR has undergone exceptional development in recent years and is currently present in 12 markets (Belgium, Brazil, Canada, France, Italy, Mexico, Poland, Portugal, Romania, Spain, the UK and the US). Energias de Portugal, S.A. (“EDP”), the principal shareholder of EDPR, is a global energy company and a leader in value creation, innovation and sustainability. EDP has been a Dow Jones Sustainability Index for 10 consecutive years. For further information, please visit www.edpr.com.